Caring for individuals with rehabilitative needs is a gentle art. It requires all the knowledge science has to offer, plus the skills of human compassion that can blossom only in a supportive environment. To expand on that vision, Generations Outpatient Wellness & Rehabilitation Center has established itself as the premier community rehabilitation practice for persons of all ages, utilizing the superior facility and equipment of our 4,000 square foot Rehabilitation Suite. 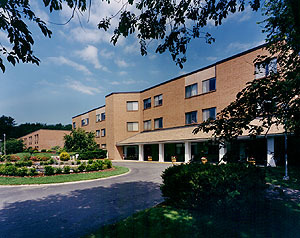 Generations was borne from the expanding therapy services of Medway Country Manor Skilled Nursing & Rehabilitation, a 123 bed inpatient facility providing both long-term care as well as specialized short-term rehabilitative care to persons transitioning from a hospital stay back to home. Being one of only a handful of facilities in the state offering outpatient rehabilitation, we found that not only could our patients return to their homes sooner by continuing to see us on an outpatient basis, but by offering these services to the general community we can help many people to avoid an inpatient stay altogether! Generations offers services to persons of all ages, from young children requiring speech pathology services to those requiring work hardening to return to their profession to older persons honing their abilities to maintain their lifestyle. Generations therapists are available six to seven days a week as necessary to improve the skills our patients need to fully participate in all day-to-day activities of life. We offer a state-of-the-art physical and occupational therapy gym, a transitional apartment, a transitional rehabilitation dining area, and speech therapy treatment areas. Please feel free to contact us to review any concerns you may be having. We are happy to speak and meet with you at any time to help determine your needs.